When you live in California, sunny days and poolside weather shine down on us most of the year. So, why not take advantage of the easy breezy sunshine with a backyard haven? This next client did just that with a pretty pool house that dazzles. 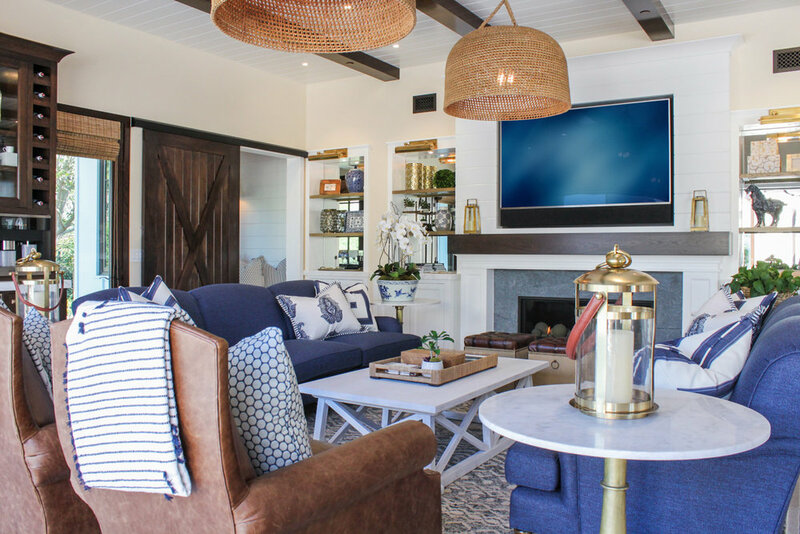 Of course, this poolside bungalow is more than just a lovely space–our clients wanted something that brought their friends, family, and kids together all year long. They began with a brilliant vision of ornate tile, marble counters, and gold fixtures, and together we put a bow on the design by adding custom furniture, charming accessories, and finishing touches. The final result is a space that exudes beautiful design and excellent functionality–a perfect balance in our book. Conversation and togetherness is really the heart of this kitchen. 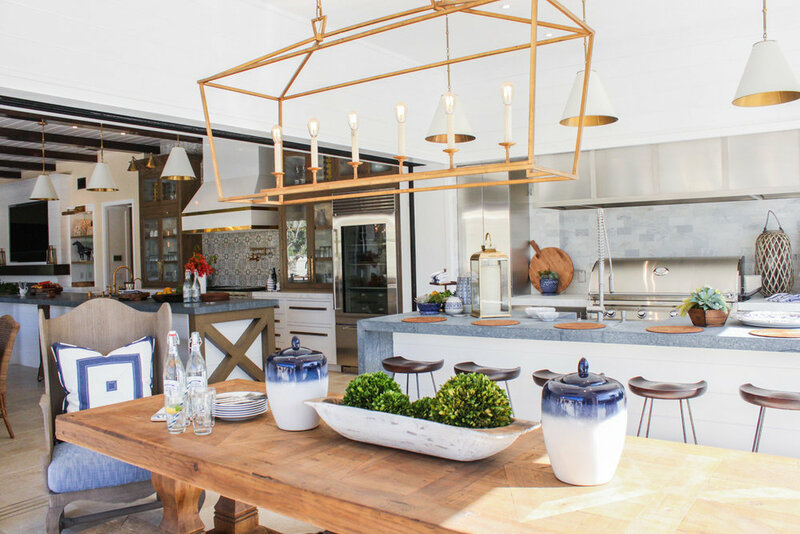 With a dining table that fits fourteen, everyone has a seat with plenty of elbow room, and while the bar provides ample space for cooking it’s still close enough to steal a fingerful of whatever scrumptious recipe is on the menu. Of course, things take a cozier turn just a few feet away in a more intimate living space where you can curl up with a cup of coffee while gabbing with a close friend. Whether you’re the cook or taste-tester, there’s plenty of room for both without feeling too far away. We know this little nook is meant for the kids, but, let’s be honest, we all wanna jump in and take an afternoon snooze! Continuing with the gold details, it’s lux but still completely inviting with soft pillows and bedding adorned in fabrics from Kravet, Ralph Lauren, and Sunbrella. Across the way, things get a little breezier in the outside kitchen and BBQ bar. Just steps away from the pool, this outdoor space is a recess from the California sun and ideal for snacking on a burger fresh from the grill. Using durable but lavish fabrics and furniture, the design is welcoming but will last for seasons to come. After a luxurious day at the pool, end the evening in a walk-in shower that’s private but still includes a little nature. You’ll feel as fresh as the design that surrounds you. There’s no denying this pool house has a gorgeous aesthetic, but, more importantly, it has the ability to bring people together–and that’s what truly makes great design. Thanks for reading!